In the westernmost corner of the Franconian wine region, framed by the low mountain ranges of Spessart and Odenwald, unique conditions have been created by time and weather. 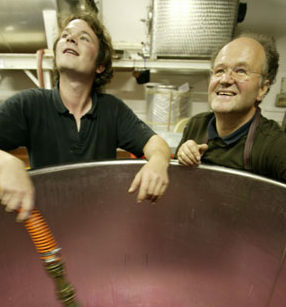 Here the Fürst Family have been making wine since 1638. In 1979 Paul and Monika Fürst built the new estate amidst the vineyards and in 2007 they were joined in its management by their son Sebastian. For the Fürsts and their viticulturist Sebastian Schür the vineyards are the biggest asset in the production of high qualitiy wines. Whether it’s the high density of planting, best rootstocks and scions, low trellises, optimal humus content, plant protection and selective picking, all aspects are regarded as equally essential andfrom pruning to picking all the most important work in the vineyards is done by hand.